48 Village tiles (including 4 summer boat tiles). A Place the blue, red and yellow workers in the cloth bag. B Place the green workers, resource counters and skill tiles at the side of the playing surface. C Sort the resource counters into the four different types to create a general supply at the side of the playing surface. D Place the skill tiles face down into a pile at the side of the playing surface. E Each player receives a player screen. These should be carefully constructed using the separate chimneys pieces to lock the walls and roofs into place. F Each player draws eight workers at random secretly from the bag, so that the colours of the workers are not disclosed to the other players, and places these workers behind their screen. Sort the large hexagonal tiles by type: home (6), boat (6), turn order (4), spring (12), summer (12), autumn (12) and winter (12). (There are sufficient bags to store each type separately). G Each player receives a home tile at random. The home tile is placed in front of the player's screen and in reach of the other players. H The player who received the lowest numbered home tile takes the purple start player worker. I The number of boat tiles used in the game depends on the number of players. Each boat tile is marked on the initial face up side to indicate in which games it is used. The number of boat tiles used is equal to the number of players. Place the relevant boat tiles in a row at the edge of the playing surface, with the side indicating the number of players face up, and the orientation facing the center of the playing surface. (Players should take the opportunity to acquaint themselves with the scoring opportunities shown on the reverse of the tiles which will be available for auction in winter). Place a number of workers from the bag and a number of skill tiles, both as indicated on the boat tile, next to or on top of each of the boat tiles. The number and side of the turn order tiles used in the game also depends on the number of players. Each of the tiles is marked to indicate whether it is used and which side is used. J Place the turn order tiles in a row next to the boat tiles, but closer to the center of the playing surface, with the side marked for the number of players in the game face up and the orientation facing the center of the playing surface. Place a number of spring tiles in the center of the playing surface as indicated in the table below. Place the side with the spring icon face up. Place the tiles so that they are at the same angle as the boat and turn order tiles and so that each player can identify with one side of the tiles. Depending on the number of players, each player receives two or three face-down winter tiles as indicated in the table below. Players may look at the reverse side of the tiles, but should not show these to the other players. Any surplus home, boat, turn order, spring and winter tiles are placed back in the box and are not used in the game. Place the twelve summer tiles and twelve autumn tiles in two separate piles. These will be used later in the game. After the set up phase, players are ready to start the game. The player who received the lowest numbered home tile starts the game in spring and takes the purple start player worker. In summer, autumn and winter the start player for that season is the player who won the bidding for the highest numbered start player tile (depicting the start player worker) in the previous season. In summer, autumn and winter turn the boat tiles over where appropriate so that the icon representing that season is visible. In summer and autumn place a number of new workers (from the bag) and skill tiles onto the boat tiles as indicated on the tiles. In the unlikely scenario that there are insufficient workers in the bag, fill boats in order with one worker at a time, but not with more workers than are stated on the tile. No new workers or skill tiles are placed in the boats in winter. In summer and autumn place a number of village tiles for that season in the center of the playing surface as indicated in the table above. Place the side with the season's icon face up. Note that the four summer boat tiles, if selected, have a summer icon on both sides. The face up side of these tiles is chosen at random. (The summer boat tiles cannot be turned over or upgraded). Any surplus tiles are placed back in the box and are not used in the game. In winter each player selects one or more of the winter tiles that they received in the set up phase. (Placing the tiles 'in the fist' is the method suggested for performing this action). The numbers of tiles selected are then revealed simultaneously and placed, still face down, in a pile in the center of the playing surface. The tiles are then shuffled (if there are more than two players), still face down, and then turned over and laid out in the same way as the earlier season tiles, but so that players do not know which tiles were selected by which player. Place any tiles not played in the box. bid for a village tile or turn order tile. 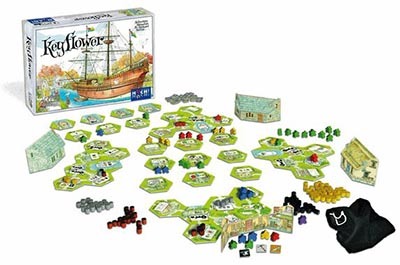 Note that the boat tiles are not bid for with the workers directly, but the contents of the boats are chosen in the order that players successfully bid for the turn order tiles. In each season play proceeds clockwise until all players have passed in succession. Therefore a player who has passed may take further actions as long as all the other players did not also pass. In order to incorporate village tiles into their village a player must win an auction for those tiles by bidding more workers than the other player(s). A player chooses which village tile or a turn order tile they want to bid for and then places one or more workers on their side of the tile. The workers are taken from behind the player's screen or from a losing bid elsewhere. A player cannot remove workers if they are winning a bid. All workers used in bidding for a tile must be of the same color as any other workers surrounding the tile (as part of a bid) or on the tile (which have been placed to use that tile). If the tile has already been bid for by another player then the bid must be with a greater number of workers than the previous bid. There is no maximum number of workers that can be used when bidding. A player's turn may consist of adding more workers to a winning bid. If workers are outbid, they can be moved elsewhere but must remain together. When moving outbid workers, a player may supplement these workers with other losing workers or with workers from behind their screen. Workers cannot be moved back behind a player's screen. 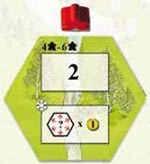 Players may also place workers on their side of the turn order tiles in order to bid for those tiles. These tiles are not added to the player's village except at the end of winter. Instead the turn order tiles determine the order that the players will choose to take the workers and skill tiles from the boats and also determine the start player for the following season. A player can bid on more than one turn order tile but they only get the workers and skill tiles from one boat. In winter they will receive each of the turn order tiles that they successfully bid for. 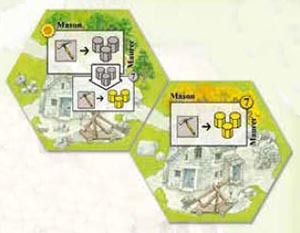 A player may acquire resources, skills, additional workers and victory points by placing workers on the tiles in their own village, in other players' villages and (except in winter) on the current season's tiles being bid for. If a tile is being used for the first time in a season then a player usually places one* worker onto the tile. If the tile is a tile from the current season and is therefore also being bid for, then the worker placed on the tile must be the same color as any worker that has already been used to bid for the tile, if applicable. A player may usually use a tile that has already been used by placing two workers of the same color as the worker previously placed on the tile. A player may usually use a tile for a third time by placing three workers of the same color as the workers previously placed. No more than six workers may be placed on a tile in one season. A player may use more workers than are required, for example if they are reallocating workers from a losing bid which cannot be split or to prevent other players from using a tile. Each use of a tile requires at least one more worker than the previous use. Therefore if the initial usage is with 2 workers, not 1 worker, then the next usage will cost a minimum of three workers, a total of 5 workers. In this instance the tile cannot be used for a third time in that season as the maximum number of workers allowed on a tile in one season is 6. If the initial usage is 3 or more workers, then no further use can be made of the tile that season. When a player uses the tile they immediately receive the benefit indicated on the tile. Any resources generated in a player's own village are placed on the tile generating the resources. Any resources generated in another player's village or from a tile being bid for are placed on the player's home tile. Any skill tiles generated are taken from the face down pile and placed behind the player's screen. Any ,white' workers generated are taken randomly from the bag and placed behind the player's screen. Any green workers generated are taken from the supply and placed behind the player's screen. In the unlikely scenario that there are insufficient resources, workers or skill tiles of the type being generated, then the player only receives the number that is available. In the case of workers, players are permitted to feel the contents of the bag to determine how many workers remain in the bag before they bid for a tile. The number of remaining green workers, resources and skill tiles can be seen by players before they bid. A player may not search in the bag for green workers if the visible supply is exhausted. The village tiles (except the summer boat and winter tiles) may be upgraded by flipping the tiles over to their reverse side. The contents of the box on the reverse side can be seen in the lower smaller box of the front side. The cost of the upgrade is shown in the upgrade box (an arrow in between the upper and lower boxes). 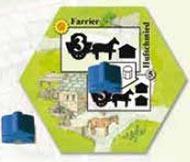 The player's home tiles and the transport tiles: farrier, stable and wainwright each enable the transport of resources and the upgrade of tiles. In order to upgrade a tile a player places a worker on one of the transport tiles (or two or three workers if the transport tile has already been used in this season). 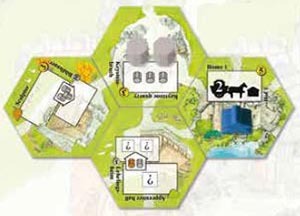 The player may then move up to the number of resources indicated on the transport tile and may upgrade one or two village tiles in their own village as indicated by the upgrade icons. one resource can be moved two tiles. Resources required for the upgrade must be on the village tile when the upgrade is performed. The resources used are placed back in the general supplies. Skill tokens required for the upgrade are taken from behind the player's screen and placed face down in the general supply. Any resources not required for the upgrade and workers (if the village tile has already been used) remain in place on the tile once it has been upgraded (flipped over). When flipped, the orientation of the village tile should be the same as it was before the upgrade. All players collect workers that they played and which form part of an unsuccessful bid and puts these back behind their screen. Any village tiles that were not bid for are removed and placed in the game box. Any workers (including green workers) on those tiles are placed in the bag. Takes any village tile they successfully bid for and any workers placed on them. Places the workers used in the successful bids into the bag (including green workers). Any workers used on tiles in the player's home village are retained and placed behind the player's screen. (Note workers placed behind the player's screen in winter are available to the player for game end scoring purposes). The player who won the number 1 turn order tile takes the workers and skill tile(s) from the boat of their choice. The workers and skill tile(s) are placed behind the player's screen. The player(s) who won the number two, three and four turn order tiles (if applicable) then do the same, followed in clockwise order from the new start player by any of the players who did not win a turn order tile. 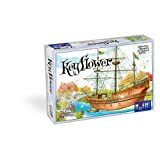 If no player bid for the new start player tile, the existing start player remains the start player for the purposes of collecting the boat contents. A player may only take contents of one boat even if they win the bids for more than one turn order tile. Usually a player will have successfully bid for the turn order tile showing the purple start player. When that tile is resolved the start player will change to that player immediately. That player takes the purple start player marker. If no player bid for the turn order tile with the start player icon then, after all of the players have taken their workers and skill tile(s), the player to the start player's left becomes the new start player and takes the purple start player marker. Place the workers used in the bids for the turn order tiles into the bag (including green workers). There are no new workers or skill tiles arriving on the boats. The player who won the bid for the number 1 turn order tile takes that tile and a boat tile of their choice. The player(s) who won the bids for the number two, three and four turn order tiles (if applicable) then do the same. If a player wins more than one turn order tile then they take these turn order tiles but do not take a second boat tile. Then in clockwise order from the new start player, any player who did not win a turn order tile selects a boat from those that remain. In the unusual circumstances that no player bid for the new start player tile in winter, the existing start player remains the start player for the purposes of selecting the boat tiles and then the start player marker passes to the player on the start player's left. 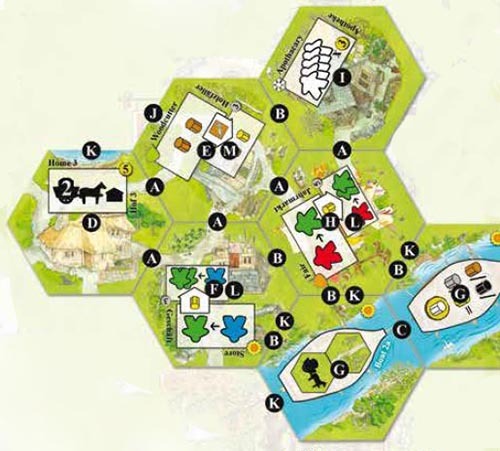 The turn order tiles and boat tiles are added to the players' villages. Players simultaneously add the village tiles, and in winter also the ,turn order' and ,boat' tiles, to their village. The sides of any tiles that are placed adjacent to each other: A road, B no road and C water, must match. 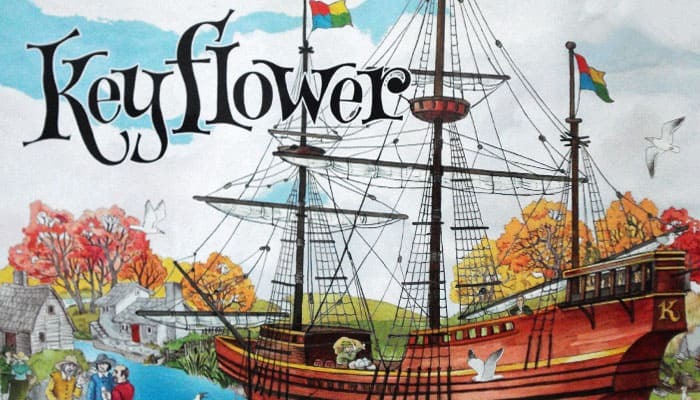 Note that the D home tiles each have five roads, E the 12 spring tiles each have four roads, F the 8 summer tiles without boats each have three roads, G the 4 summer boat tiles have no roads, H the 12 autumn tiles each have two roads and the I 12 winter tiles each have one road. J In the 3 to 6 player games it is recommended that players do not place tiles with roads so as to prevent tiles being placed next to the water side of their home tile, as this would prevent them scoring a bonus from the Sea Breese boat tile in the event that they acquire this. K Note that boat tiles (including the four summer boats) do not have to be placed so that the water sides connect. Note that resources may only be transported along roads or, if obtained from outside the player's own village, direct to the home tile. So players should place L those tiles which require resources in order for them to be upgraded close to M resource production tiles where feasible. Once positioned, tiles cannot be repositioned. The game ends at the end of winter. Players now score points for the tiles in their village and for their gold counters. 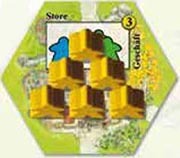 Only resources that have been placed on the autumn barn, blacksmith, stone yard and timber yard tiles during the course of the game may be kept on those tiles for scoring purposes. Note: gold can be used as a substitute for the other resources on the barn, blacksmith, stone yard and timber yard tiles if it has been transported to those tiles during the game. However if gold is used on these tiles the gold does not also score one point for being gold as each item can only be scored once. 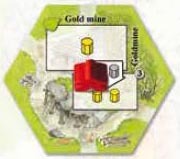 Resources remaining in the barn, blacksmith, stone yard and timber yard cannot also be counted for the other resource scoring tiles the jeweller, mercer's guild, watermill and windmill. All other resources, skills and workers can be allocated as required to the other scoring tiles. No transport is required. Each item can only be scored once and i can only be allocated to one bonus tile. For example a worker cannot be ; allocated to both the apothecary and the craftsman's guild and a resource cannot be allocated to both the watermill and the windmill. 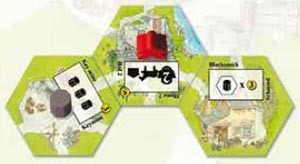 For all of the scoring tiles except the Keythedral, the game end bonuses may be scored multiple times if the player has sufficient resources, skills or workers. For scoring purposes, the purple start player marker may be declared by the player who successfully bid for it as a resource, skill or worker of any color and, if applicable, placed on the barn, blacksmith, stone yard or timber yard. Gold counters are worth one point each if they have not been allocated to any of the scoring tiles. For example, if a gold counter is allocated to the jeweller for two points it does not score an additional one point. If players have an equal number of points the players are tied and should play again in order to determine the winner.